The City is calling on Business Improvement Areas, developers and other individuals interested in implementing TO360 in their areas to get involved in the TO360 Project. 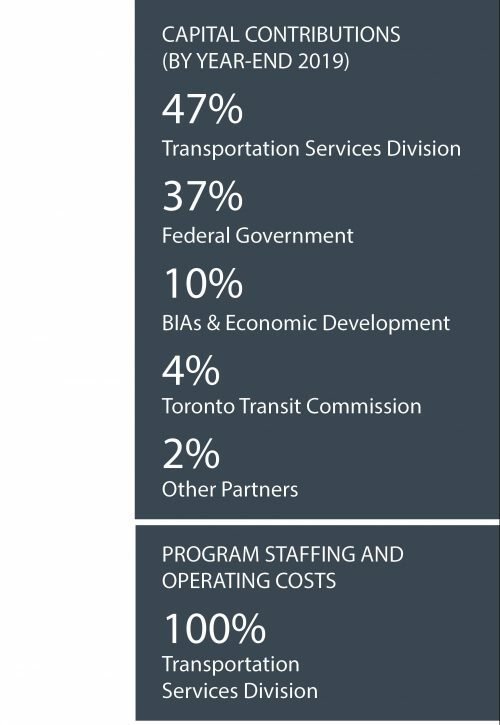 The Toronto 360 Wayfinding project is managed by the Public Realm Section of the Transportation Services Divison. Contact the TO360 Project Manager to learn more. TO360 is also coordinated with ongoing wayfinding projects by partner divisions and agencies such as the Parks & Trails Wayfinding Strategy. A broad range of public and stakeholder engagement activities were key to the development of Phases One and Two. In Phase Three, engagement activities with local area stakeholders will focus on building an understanding of pedestrian movement, landmarks and destinations within each neighbourhood. These activities will help city staff identify and prioritize information that is shown on maps. 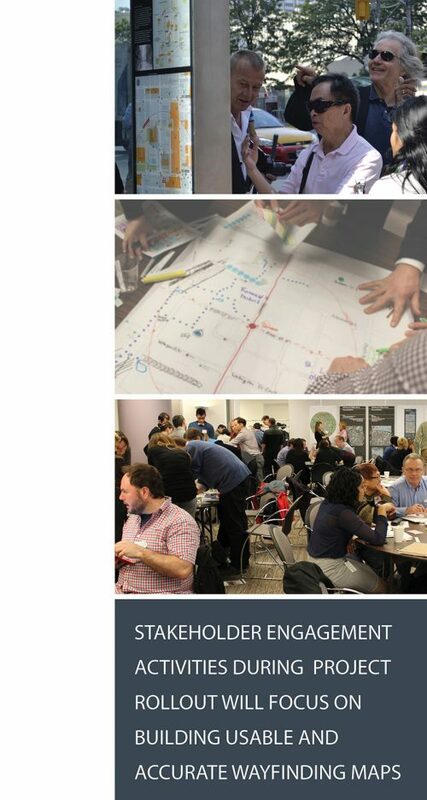 Local area stakeholder experts will include individuals representing organizations with area-specific knowledge and expertise such as residents associations, Business Improvement Areas, “friends-of” groups, Ward Councillors, and others. TO360 has been a partnered project from the very beginning. Partnerships will continue to critical as TO360 is implemented across the city. TO360 is funded through a combination of government and third-party investments, allowing project partners to share programme costs and benefits. The project will rely on city funding for core deliverables such as wayfinding design, mapping database development and sign maintenance, along with contributions from our wayfinding partners for implementation of TO360 signs in neighbourhoods and commercial areas. Transit shelter walking maps and a digital base map that can be used by wayfinding project partners are funded by the City and will be rolled out city-wide. As the primary purpose of wayfinding is to enable people to find their way, TO360 wayfinding signs do not include advertising. Project stakeholders have fully supported this objective. Existing wayfinding legacy products will continue to include advertising as part of a City Council approved contract. TO360 on-street signs will be implemented in neighbourhoods where there is partner interest and pedestrian activity. Many neighbourhoods are ideal candidates for TO360 on-street signage. These include places with high levels of pedestrian activity and people who are unfamiliar with the area, as well as Business Improvement Areas, and areas near transit stations. 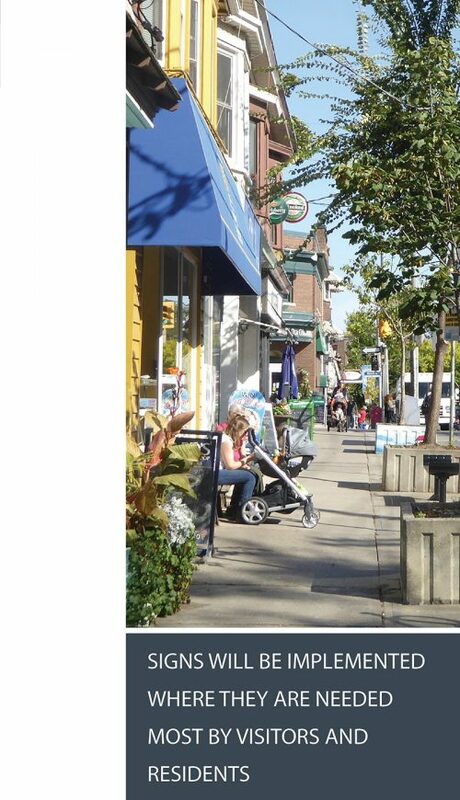 Rollout of TO360 on-street signs will grow outwards from the pilot project, including full coverage in the TOcore planning area and focused coverage in other areas across the city. The rollout of TO360 will be flexible and will consider other factors such as where there is partner interest and opportunities, and where future transit and streetscape projects are expected.